Since 1997, IEF members have engaged and participated in civil society discussions within the international and United Nations framework. These opportunities have helped open up and expand the dialogue within the wider community to promote the application of spiritual and ethical principles to the challenges of the environment and sustainable development. Recently five IEF members participated in a series of United Nations meetings in Bonn, Germany, to prepare civil society for the UN Conference on Sustainable Development (Rio+20) next year. Arthur Dahl participated in a UNEP Global Consultation with Major Groups and Stakeholders on Rio+20 at the German Ministry for Environment on 1 September, and the UNEP Regional Consultation for Europe in preparation for the UNEP Governing Council/GMEF on 2 September. As representative of the International Environment Forum (IEF), Arthur co-coordinates the UNEP Major Groups and Stakeholders Advisory Group on International Environmental Governance (www.agieg.net). In the global consultation, he moderated a working group on the institutional framework for sustainable development. One of the ideas he is putting forward is the concept of a UN Forum on Ethics and Religions patterned on the UN Forum of Indigenous Peoples, based on a Baha'i International Community proposal in its statement to the World Summit on Sustainable Development (WSSD) in 2002. Another is an Office of Ethical Assessment in the UN, to provide policy reviews on the ethical implications of UN decisions and policies based on accepted international principles and the major religious and cultural traditions. Arthur will be coordinating the Advisory Group's inputs to the Rio+20 process. 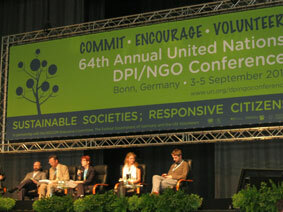 The 64th UN Department of Public Information NGO Conference, on the theme "Sustainable Societies, Responsive Citizens", took place on 3-5 September, with over 2,000 participants including additional IEF members Peter Adriance, Sylvia and Onno Vinkhuyzen, and Victoria Thoresen. The Baha'i International Community organized a workshop on "Making the Invisible Visible: Values and the Transition to Sustainable Consumption and Production". The room was full, and many had to be turned away. Peter and Victoria were among the presenters. The BIC also organized a working dinner for experts on the issue of extremes of wealth and poverty, which it is preparing for Rio+20. The Partnership for Education and Research about Responsible Living (PERL), coordinated by Victoria and in which IEF is a partner, organized a workshop on "Moving to Sustainable Living through Education, Gender Equity and Sustainable Economic Initiatives", with Victoria as one of the speakers, and she spoke in another workshop as well. Arthur was rapporteur for the ICLEI-UNEP workshop ―Assessing Stakeholder Participation in International Environmental Governance Processes‖. The conference allowed us to renew or maintain contacts with many civil society representatives we have met or worked with at previous UN conferences. IEF was also invited by the Earth Charter Initiative with faith communities to collaborate in a research project on the spiritual dimensions of sustainability. They have already worked with UNESCO on a book on faith communities' involvement with education for sustainable development, for which Arthur submitted a Bahá'í perspective. They are now expanding on this with a draft statement from the world's religious and spiritual traditions, "Towards Rio+20 and Beyond - A Turning Point in Earth History". A film based on interviews about the outcomes from Bonn and the hopes for Rio+20, including the spiritual dimension, is being produced to motivate involvement in the Rio+20 process, and Arthur was interviewed for that as well. After the DPI Conference, four members of the IEF Governing Board (Peter Adriance, Arthur Dahl, Sylvia Karlsson-Vinkhuyzen and Victoria Thoresen) met with BIC representatives May Akale, Ming Hwee Chong and youth representative Mahyar Nicoubin, with IEF member Halldor Thorgeirsson of the UNFCCC Secretariat in Bonn joining for an hour. We reviewed our plans for participation in the United Nations Conference on Sustainable Development (Rio+20) in Rio de Janeiro next June, as our 16th IEF annual conference. The Science and Technology Major Group (to which IEF belongs), will be organizing a Science Forum in Rio (as they did in Johannesburg), so IEF needs to be ready to propose speakers. IEF is looking for other opportunities to partner in events in Rio. IEF is considering topics for a submission to the UNCSD, which might include indicators, education, scientific and ethical assessment, public goods, ethical principles for the green economy, and civil society involvement in institutional arrangements for sustainability. It would be better to focus on a few themes rather than spreading too thinly. IEF and EBBF tentatively plan to have a joint booth in Rio, as they did in Johannesburg. Some form of electronic conference will also be planned.